This is a proper right wing gathering, a gathering of the nicely off section of society. 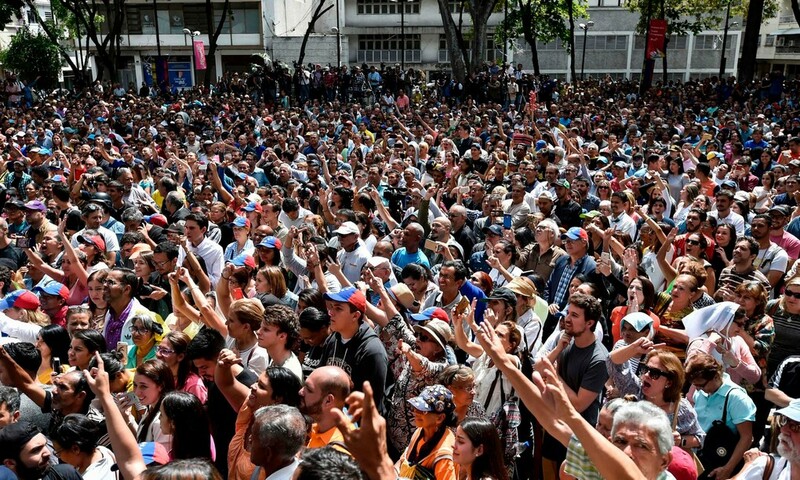 This is a group of those who have corruptly been siphoning Venezuela’s great wealth for decades and who want to make sure the gravy train flows properly in their direction again. It is, in short, a group of exactly the kind of people you would expect to support a CIA coup. Those manicured hands raised in the air will never throw rocks, or get involved in violence unless against a peasant strapped to a chair for them. It is not this crowd which will suffer as public disorder is manipulated and directed by the CIA. These wealthy ones are immune, just as Davos serves as nothing but an annual reminder of how very poorly God aims avalanches. There is real suffering in Venezuela. The CIA is working hard to stoke violence, and the genuine poor will soon start to die, both in those egged on to riot and in the security services. But do not get taken in by the complete nonsense that this is a popular, democratic revolution. It is not. It is yet another barefaced CIA regime change coup.